I’ve been a very bad blogger, and it’s been a long time since I posted anything about knitting. First there’s Mailin, made from some lovely, squishy merino. The cowl neck is optional, and I probably wouldn’t normally have made it, but I had plenty of yarn and it’s so soft that it’s delightful around the neck. 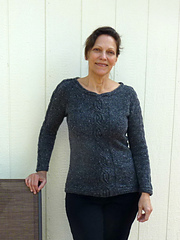 I’d like to make this pattern again with the scoop neck option, and maybe even a short-sleeved version. Next is Milana, a lovely design that I fell in love with when I first saw it. The cables don’t show up quite as well in the tweedy, slubby yarn as I’d like, but I’m still very happy with it. Then there’s Ms. Moneybags, a totally impulsive knit. The little bunny pattern was so adorable I had to make it. Unfortunately my gauge was off and I had to full it to fit the frame, which makes the pattern a little blurry, but I don’t think my hands could have taken knitting it on smaller needles than I was using (US 0/2mm). I’m not sure what I’ll use it for, but it was fun to make. That gets us caught up to this month. I have two more projects just off the needles coming up next. This entry was posted in Uncategorized and tagged bag, FO, knitting, scarf, sweater. Bookmark the permalink. At least when you’re not blogging, you’re clearly using your time wisely and creatively. I love all your FO, especially Ms. Moneybags. The sweet rabbits remind me of Clement Hurd’s illustrations in Margaret Wise Brown’s The Runaway Bunny. Wow, Cheryl! Just beautiful projects. The sweaters look great on you — and Ms. Moneybags is so charming. My favorite, though? Holey square! Love it! Lovely projects and a great recap. Your sweaters look terrific! Wow! You are good! I must look up the Holey Square – it’s beautiful. Cool. 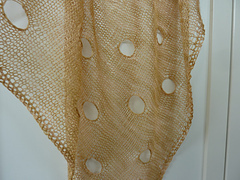 Holey Square is lovely — I love the simplicity of a project like that, except when it comes time to actually knit it! Love that little bag, and have totally knit something just because it was fun or I was intrigued.